This outfit incorporates three of my favorite things: boyfriend jeans, a slouchy cashmere sweater and mary janes. I've had all three of these pieces in my closet for at least two years now and they consistently stand the test of time. 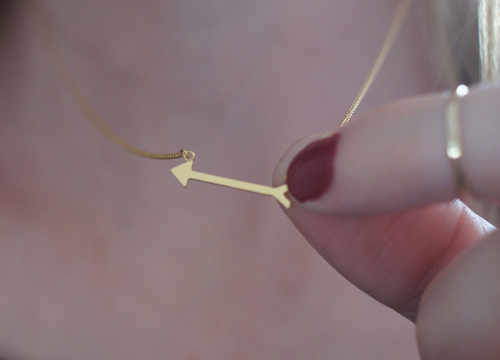 How great is my delicate yet edgy arrow necklace from Stella & Dot? Love it! I hope everyone had a great weekend! This outfit is the perfect balance of comfy & chic - adore that dainty necklace! cute casual look, great heels. Love the new necklace! You look beautiful as always! This is definitely a very "you" outfit, as I know it! You rock boyfriend jeans like no other! And that necklace is stunning! xo! What a perfect mama/chic look! I adore my boyfriend jeans as well...don't they just go with everything?! You look beautiful and comfortable! I adore your boyfriend jeans. Love your casual outfit, especially the necklace. If you get a chance I would really appreciate it if you would like my facebook page: Vodka Infused Lemonade. I know why you adore all the pieces...so easy to wear and versatile! Love the MaryJanes...and that S&D necklace is so sweet..loving their dantier pieces for Spring. i just wanted to let you know that i love your blog and your style. i can totally relate to that simple and chic look and i love grabbing some inspiration from your amazing style! That makes my day! Thanks so much! I have this necklace as well! :) Such a great one too! Love those jeans AND those shoes (of course)! :) Looking gorgeous as ever, Audrey! Hope you and the little bean are doing so well! Thinking of you! i can TOTALLY see why you love this outfit! it looks amazing on you! p.s. : I am hosting a giveaway for those who are interested! In love with the sweatshirt, I've been looking for an option like this. I keep trying to get when for cheap, but they just don't seem to lay right on my body. I'm thinking I may need to head over to the Joie and try this one and go for the splurge! I love this outfit. It is one of my staple uniforms. Perfect elements, all my favorites too! What a fashionista,...you look fabulous ! i love love love a slouchy jean! cannot wait to got check these out. www.thebluecloset.com - my blog about children's fashion.